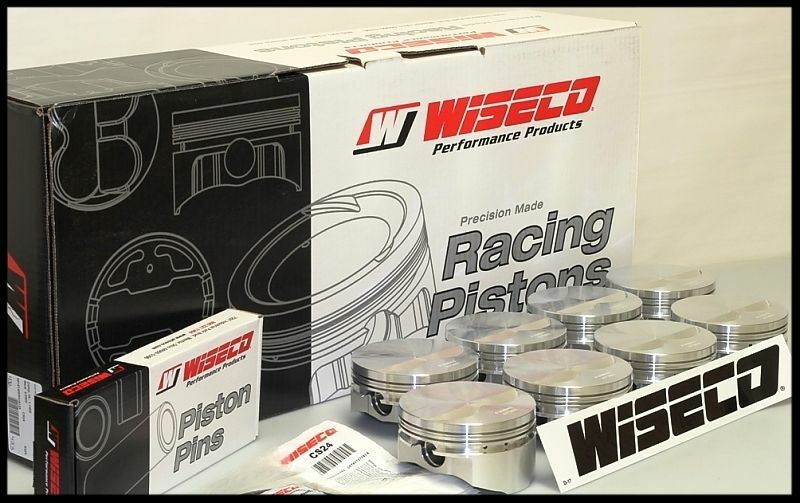 WISECO FORGED PISTONS & RINGS 4.155 BORE SIZE X 4.00 STROKE FOR SBC CHEVY SBC 434 ENGINES, FLAT TOP FOR USE WITH 6.0 BUSHED OR PRESS FIT RODS. The Wiseco pistons are rated very high in the performance industry. They normally offer three levels of pistons, starting with the Pro-Tru Street version made with 4032 forged alloy. The next level up would be the Pro-Tru series that are much more expensive and made from 2618 aircraft alloy. The highest level pistons they offer are their professional line made for high level racing. Those are normally in the $700-$1100 price range. The calculations below assume your pistons are at zero deck. Let's say your compression calculates out to be 11.09 for example based on having the pistons at zero deck (flush with the deck), but your pistons were going to be .005 in the hole, then the comp. ratio would only drop to 10.96, and if left .010 in the hole, then it would drop to approx. 10.84 We do recommend having your block decked to allow the piston to set anywhere from flush (zero) to .005 in the hole for optimal performance. We used a 4.200 head gasket diameter, and a .040 head gasket thickness in our calculations to come up with our comp. ratio values. Our custom made Wiseco pistons have a compression height that is .015 taller than nearly all catalog pistons on the market. We find this to be a very valuable feature. Since our pistons sit at a taller than normal compression height, you will only have to remove approx. .010 off the deck surface of a virgin block to achieve a zero deck. This also allows for future deck re-surfacing and still not ending too far below stock deck height. Since nearly all catalog pistons on the market sit .025 below the surface of a virgin block, the only way to achieve a zero deck using such pistons would be to cut .025 off the deck surface. This compromises the integrity of the block, in our opinion. Should you decide to leave the block deck higher up, using such pistons creates a new issue of having a very poor quench/squish zone. The only way you could really take advantage of a catalog piston is by having a block that needs to or has already been butchered down to 9.00 deck height. At that point, we don't think you should not use such a block. Having the piston sitting flush with the deck is very desirable, regardless of the fact that your overall compression ratio is slightly higher than if it were sitting below the deck. We have found that 95% of our customers are using a virgin block or a block that is close to stock deck height. This is why we have designed our pistons to have a taller compression height. On very rare occasions, you may end up with a block that has the piston out of the hole by a few thousandths and this not a problem at all. 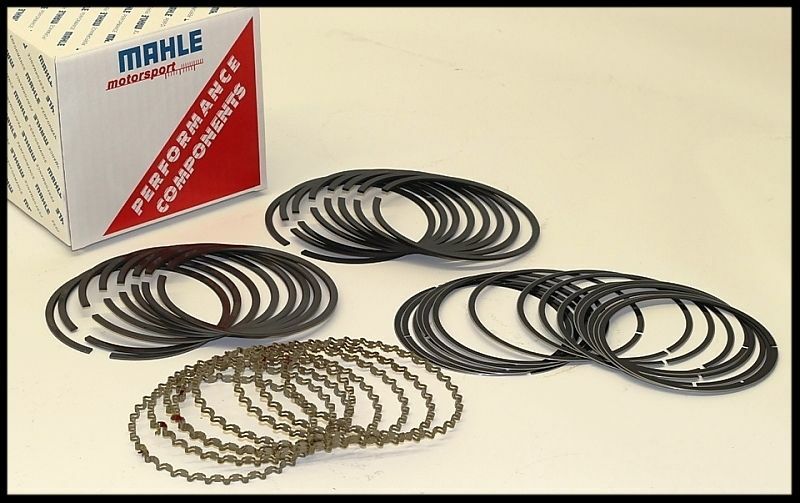 Most head gaskets are approx. .040 thick, and should you end up with a quench zone of .035, then that is perfectly ok. If the quench zone ends up too far below .035, then there are plenty of .050 thick head gaskets on the market. One more benefit to this is that most machine shops charge much more to deck a block down from stock deck height to 9.00 than they would to do a light cleanup, and that's all that's needed when using our Wiseco pistons. Another good feature about our pistons having a taller compression height is that the ring land above the top ring is much stronger by being .015 thicker. When pistons encounter the effects of detonation, it is not uncommon to see pistons with the ring land above the top ring broken off. The thicker ring land also makes a better heat sink. We have built approximately 3500 engines using the Wiseco pistons. The engines have been for street rod and strip use. We have seen no problems, nor have there been any complaints. They are an excellent product in every respect. 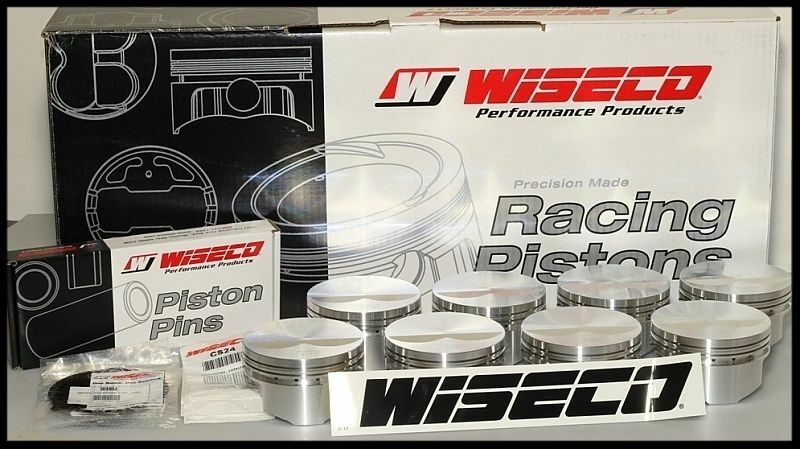 WISECO FULLY FORGED FLAT TOP PISTONS RATED AT 700+ HP. THIS AUCTION IS FOR A FULL SET OF PISTONS AND RINGS. WISECO PISTONS ARE 100% MANUFACTURED IN THE USA. THEY ARE ONE OF THE HIGHEST RATED PISTONS IN THE COUNTRY. These pistons are for use with 6.0 full floating bushed rods, or press fit. The compression height is 1.015 -5cc FLAT TOP WITH 2 VALVE RELIEFS. RING GROOVE SIZE, 1.5mm 1.5mm 3.0mm FILE FIT RINGS INCLUDED. SEE FULL PISTON SPECS BELOW. 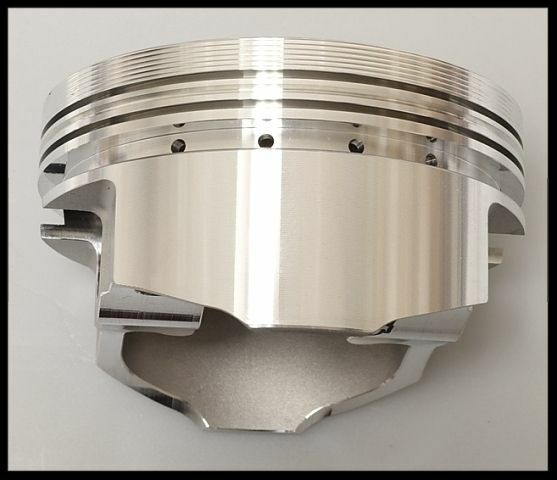 FULLY FORGED FLAT TOP OR DISH PISTONS RATED AT 700+ HP. THESE PISTONS ARE VERY RESISTANT TO THE DAMAGE CAUSED BY DETONATION COMPARED TO NON FORGED PISTONS. THEY HAVE TWO VALVE RELIEFS AND USE FULL FLOATING WRIST PINS. Sold in sets of 8. 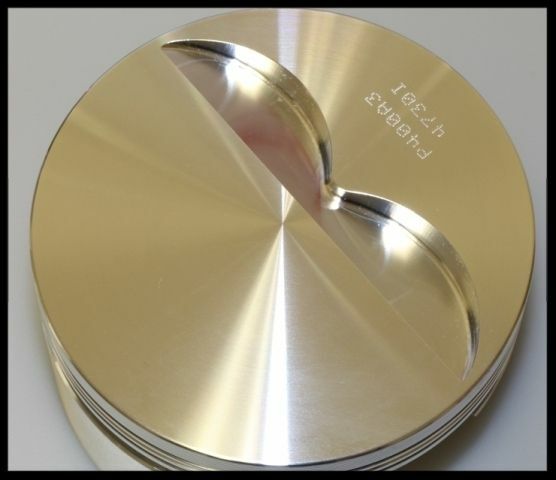 We offer these pistons in flat or dish style as well as dome top, and most other bore sizes. See our other listings. Our sales staff has limited technical knowledge on this product and may not be able to answer many of the questions asked. Many of the questions asked are if we have pistons for certain applications. Please check our wide variety of pistons to see if what you need is listed. Be absolutely sure that you select the correct bore size and piston volume before purchasing. It is also important that you know what rod length you have. The rod length required is clearly stated in the ads. When searching for various size pistons, you can simplify your search by using common key words in the search bar. We update the technical information in our listings on a regular basis.